September | 2014 | Mom of Tornado - The realization of the last 30 something yrs. Hello everyone.. It’s been a while since I posted anything and I do apologize.. It’s been a hectic few months with my little one starting Kinder. I will do a whole separate post on that because he is going thru a transition period from preschool to kinder. As some of you may know when your first and only child goes from the safety of a preschool environment to the wild side of elementary school. But as I was going thru my products that I’ve obsessed with this month I decided to let you know what my fav for the months have been. Not Your Mothers : Clean Freak Refreshing Dry Shampoo: As you know I have tried a few dry shampoos to attempt to find the right ones for my needs. After one day my scalp becomes very oily and after two days its flat and dull. Since I went back to a dark color the oily look would be too greasy on me if I allowed my hair to get that way. I saw this advertised at Walgreens and decided to give it a try. Shake the can and spray then brush or finger comb the hair to blend in the powder residue. That’s what soaks up the oil. Added bonus for me at least is that is also pumps up my roots and gives me some volume. I’m all about the vava voom volume. Shampoo and Conditioner: L’oreal Paris Advance Haircare Shampoo: Volume Filler Thickening Shampoo Conditioner: Smooth Intense Polishing Conditioner: I change up my shampoo frequently so my hair does not get used to one specific formula so when I saw this, on sale of course, I decided to purchase the shampoo and conditioner The Shampoo leaves my hair squeaky clean with just one application. Then I apply my conditioner and leave it on while I soap up. I wait at least 5 min because my very much colored hair needs a good conditioning once in a while. Great results so far. I’ve already purchased another set of bottles. Kiehl’s Aromatic Blend: Orange Flower & Lychee – Liquid Body Cleanser : I picked this up at Nordstrom and OMG I am obsessed with it. The scent is so fresh and so clean with that hint of feminine. The scent lingers on my body all day as well. I’m not into heavy scents at all so this is perfect. Jordan Essentials Naturally Unscented Shea Body Butter: I saw this product on Facebook and decided to give it a try because of my sons eczema and my mothers extremely dry skin that was causing her pain. I have to tell you we have used two tubes of it because it has helped both of them so much. After I shower I lather this on all over and it leaves my skin so soft and defiantly non greasy. bsorbs into my skin easily as well. I know I’ve noticed a huge difference on my sons skin. Click here to visit Jordan Essentials. Let me know if you have tried any of the mentioned products. I’d love to hear what you think. 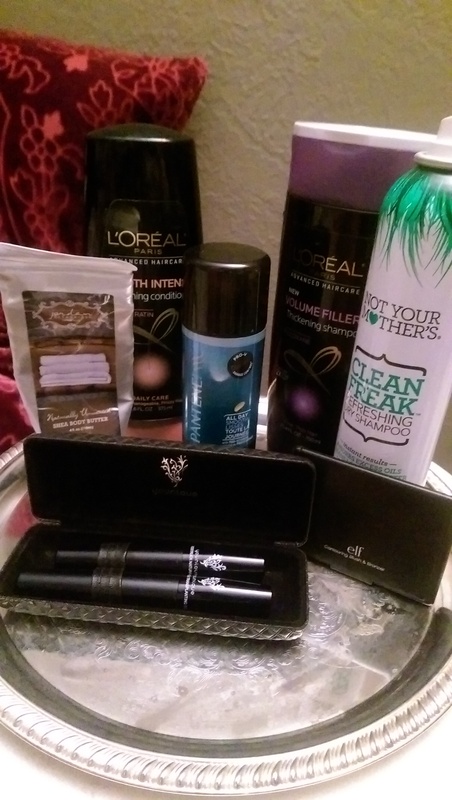 As always let me know if you want me to review any of the mentioned products. If you like this post share it and subscribe … Follow me on twitter at katiiz95 and or on Facebook.com/momoftornado. Disclaimer : all products we purchased with my own money and all opinions are alley my own. I have included one referral link for Younique products.